On Wednesday, June 13, at approximately 10 a.m., Lehigh Township Police were dispatched to the 1400 block of Blue Mountain Drive for a tractor trailer into the woods. The truck, an International Truck tractor pulling a flatbed trailer, was traveling down the mountain on Blue Mountain Drive. As the truck traveled through the sharp curve, the truck jack-knifed and left the roadway. The truck was operated by Keyller Gonzalez, 26 years old of Allentown. Gonzalez was not injured in the crash. The truck Carrier is Phil Logistics, 274 Butler Ave., Butler, PA. Speed was a factor in the crash and the truck is being held pending a post crash inspection. The roadway was closed for over an hour for tow crews to extricate the truck from the woods. 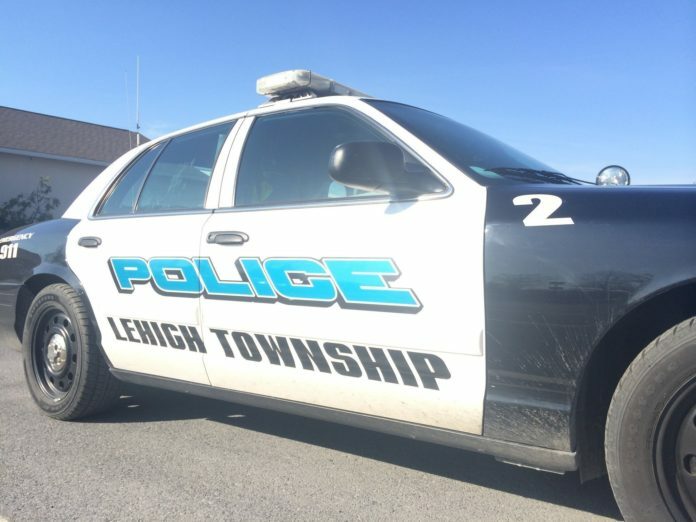 On Thursday, June 14, at 7 a.m. Lehigh Township Police were dispatched to Route 248 and Indian Trail Road for a two vehicle head-on crash involving a tri-axle Freightliner dump truck and black Chevrolet Malibu. The Freightliner was driven by Dilman Carrillo, 52 years old of Jersey City, NJ, and the truck was fully loaded. The company who owns the truck is Zelia Trucking Inc. of Colonia, NJ. The Freightliner was traveling westbound on 248 negotiating the curve at Indian Trail Road. According to witnesses, the dump truck swerved into the oncoming lane of travel and collided head-on with the Malibu, driven by Jeffrey Sell, 24 years old of Lehigh Township. The Malibu rolled over onto the roof in a culvert. Sell was wearing a seatbelt and received minor injuries in the crash. The truck operator was uninjured. The Freightliner dump truck is being held for a post-crash inspection and weight verification. On the same date, at 10:30 a.m., Lehigh Township Police were dispatched to a crash on Route 946 (W. Mountain View Drive) at Oak Road, for a two vehicle collision involving a car and a motorcycle. Arnold Vogel, 77 years old of Lehigh Township was traveling east on 946. According to a witness, Vogel, who was driving a Ford Taurus, turned left onto Oak Road, in front of a Harley Davidson motorcycle. The motorcycle, operated by Gary Barkanic, 61 years old of Palmerton, collided with the Ford and was thrown from the motorcycle. Barkanic was flown via PennStar to St. Luke’s Hospital, Fountain Hill for numerous injuries. Barkanic was not wearing a helmet. A crash reconstruction officer from Lehigh responded to the scene. The roadway was closed for almost three hours. The crash is still under investigation. Lehigh Township Fire Department and Lehigh Township Fire Police, as well as Northampton Regional EMS assisted with all three crashes.